It is easy to grow carnivorous plants. They are not so dangerous that they will show their teeth, snapping at every living creature that comes near them. Instead carnivorous plants are interesting and sculptural plants. Arrange several of the plants on a tray with a raised edge since they prefer to be watered from below. Carnivorous plants do not require to be fed on meat balls but is satisfied with an insect now and then which they catch themselves. The carnivorous plants grow in poor, acidic and humid areas where they supplement the low mineral content of the growth medium with the nutrients that are released when an insect is decomposed in their traps. The plants should therefore not be fed. Since carnivorous plants are marsh plants, they prefer to be kept moderately moist and do not tolerate drying out. It is important to water them with rainwater or boiled, cooled water as the plants do not tolerate the high calcium concentration in drinking water. Sarracenia (pitcher plant) has leaves that meet to form a trumpet-like, reddish or greenish tube with a lid-like wing at the top. Despite the innocent look of the ”trumpets”, no insect will escape them after a visit. On the inside, the ”trumpet” has downward hairs so that the insect slides down into the liquid on the bottom. The liquid contains enzymes that dissolve the insect after which the plant absorbs the minerals. 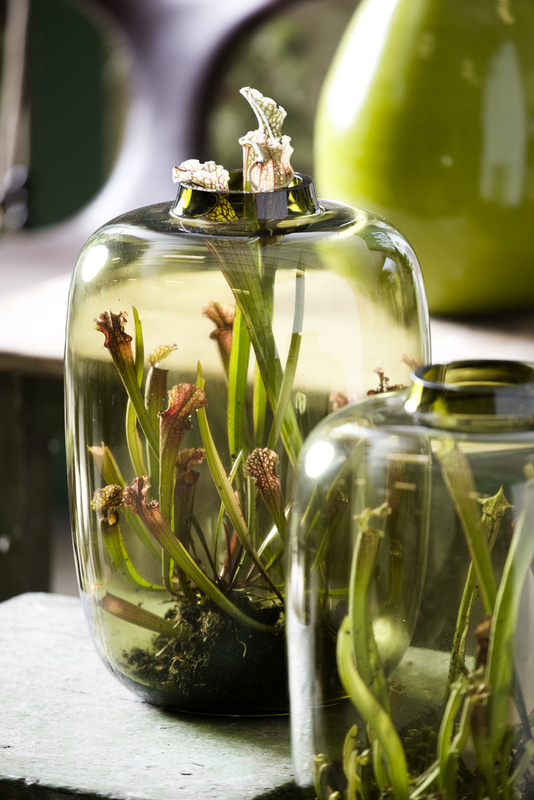 Sarracenia tolerates temperatures down to –10° C and therefore thrives excellently outdoors where it will wither in the winter. Other available carnivorous plants: Dionaea muscipula (Venus fly trap), Drosera (sundew), Nepenthes (pitcher plant), Pinguicula (butterwort) and Utricularia (bladderwort).